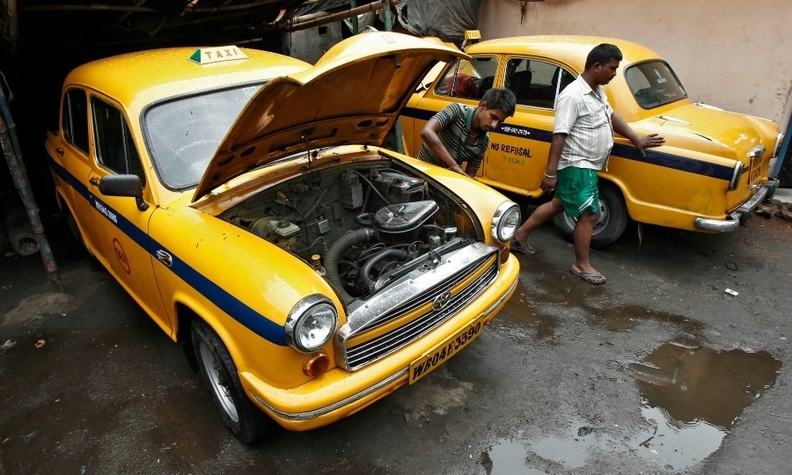 A mechanic repairs a yellow Ambassador taxi at a workshop in Kolkata, India. The car has lost sales to more technically advanced rivals with contemporary designs. MUMBAI (Reuters) -- The Indian maker of the iconic Ambassador has halted production of the four-door sedan citing weak demand and a lack of funds. The move casts doubt on the future of a vehicle that has looked essentially the same for nearly six decades. Hindustan Motors Ltd. said in a statement it had suspended work at its Uttarpara plant, outside the eastern city of Kolkata, until further notice. Modelled on Britain's Morris Oxford, the Ambassador was the first car to be made in India, according to the company, and was once a status symbol widely used by Indian officials. But the model began losing its dominance in the mid-1980s when rival Maruti Suzuki introduced its low-priced 800 hatchback. The Ambassador lost further cachet and market share when global automakers began setting up shop in India in the mid-1990s, offering models with contemporary designs and modern technology. The Ambassador has remained the choice of a dwindling share of bureaucrats and politicians. It is also still in use as a taxi in some Indian cities. In a statement on Saturday, Hindustan Motors cited "worsening conditions at its Uttarpara plant which include very low productivity, growing indiscipline and a critical shortage of funds," together with a lack of demand for its core product, the Ambassador, as the reasons for the shutdown. "The suspension of work will enable the company in restricting mounting liabilities and restructure its organization and finances and bring in a situation conducive to reopening of the plant," the company said in the statement. Some industry watchers said it would be difficult for the "grand old lady" of the Indian car market to make a comeback. "In the present shape I don't think the Ambassador has got any chances of revival," said Deepesh Rathore at research firm Emerging Markets Automotive Advisors. "It doesn't make any business sense," he said. Despite its dwindling sales, the distinctive car with its bulbous design and roomy interior has many admirers and was last year named the world's best taxi by the BBC's popular Top Gear television show. "There are newer cabs in Kolkata of different companies now, but we still drive an Ambassador and cannot think of the city without it," said Ashok Kumar Singh, 32, who has driven a yellow Ambassador taxi in Kolkata for a decade. "She is my livelihood," he said.